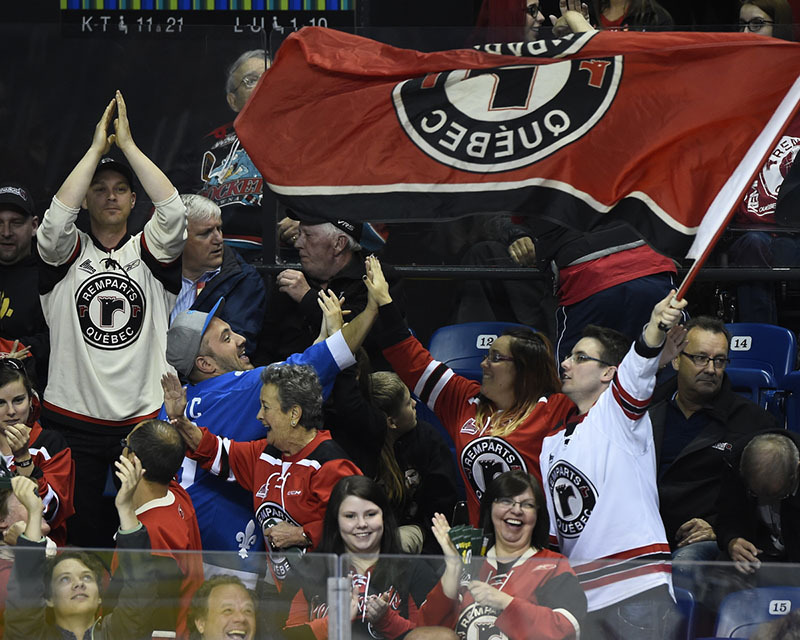 For a brief stretch in the opening period of Friday’s Memorial Cup semifinal, it looked like the Quebec Remparts would pick up right where they left off in their tiebreaker win a day earlier over the Rimouski Oceanic. 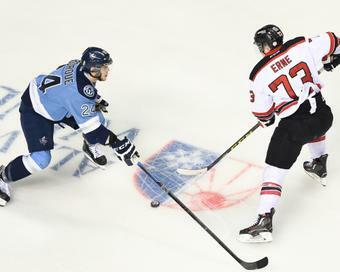 Adam Erne scored early to make it 1-0 for Quebec, and with the crowd on their side the Remparts looked to be on their way to the title game. However, a lot can change in the course of 60 minutes. 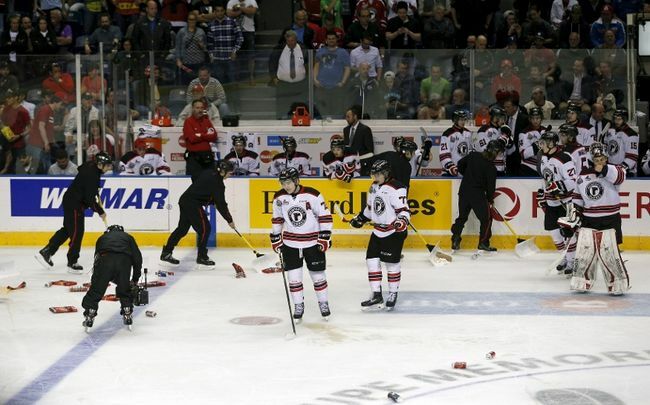 In between the fans throwing debris on the ice as they were upset about the reffing, the WHL champion Kelowna Rockets came out with a vengeance and ran the Remparts out of their own rink. 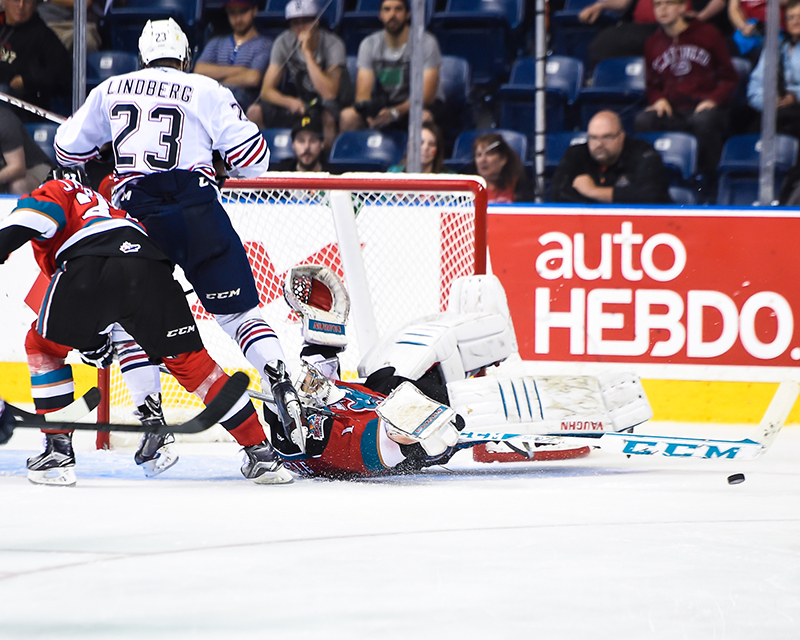 The 9-3 win for the Rockets was similar to their rout of the Rimouski Oceanic in the round-robin. Almost the entire team was finding the back of the net, with the big guns like Leon Draisatl, blueliners Josh Morrissey and non household names like Justin Kirkland all scoring. 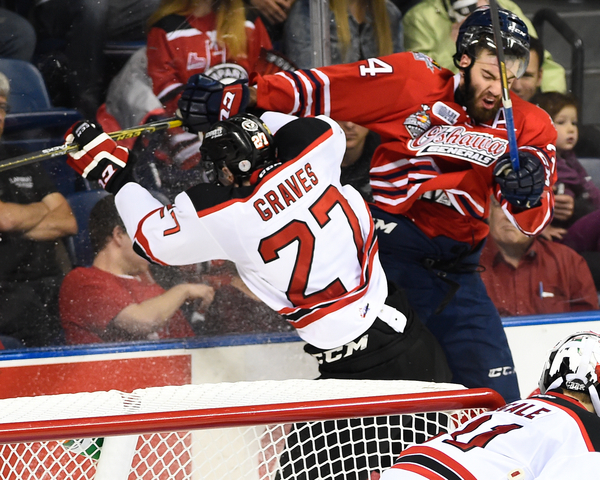 For those watching the game, it was an impressive sight, and it might not be what the Oshawa Generals want to see in Sunday’s final. Now the Rockets have had two okay showings in the round-robin losses and were shut down by Oshawa with ease on Tuesday. But with a long layoff and a red-hot team to deal with, this might be too much to handle. 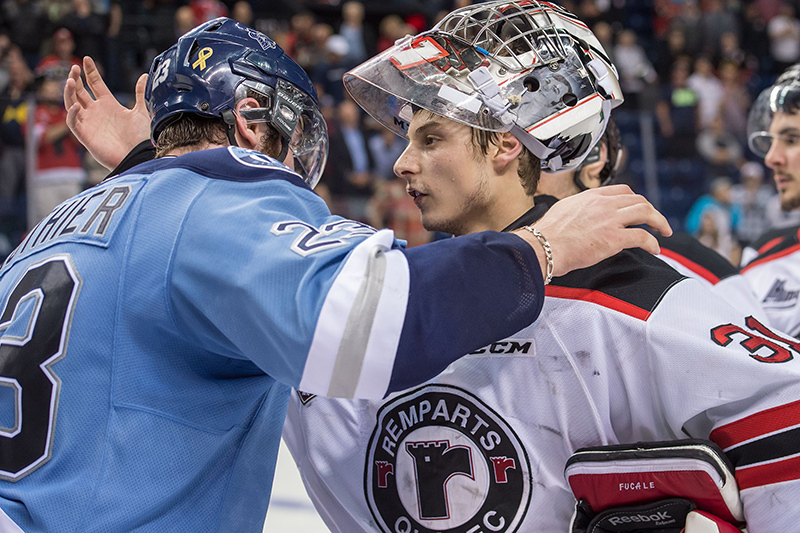 When it comes to the Remparts, the 2015/16 season will be very different. Not only will they be in a new rink, but Zach Fucale, Adam Erne and Anthony Duclair will all be moving on to the pro ranks. There’s a lot of holes to fill, but next year’s squad probably won’t be as strong as this one. The one good thing though is that they have hopefully ended, for now at least, the narrative that the Memorial Cup host doesn’t deserve to be there. Sure Saskatoon and London weren’t that great in hindsight, but Quebec was a threat all year to win the title and could have won this tournament. Hopefully, the Red Deer Rebels will be just as good in 2016. I’ve seen some interesting things happen in my time watching the Memorial Cup, but the unofficial eighth and ninth games of the QMJHL final between the Rimouski Oceanic and the Quebec Remparts are up there with the strangest things I’ve seen so far. 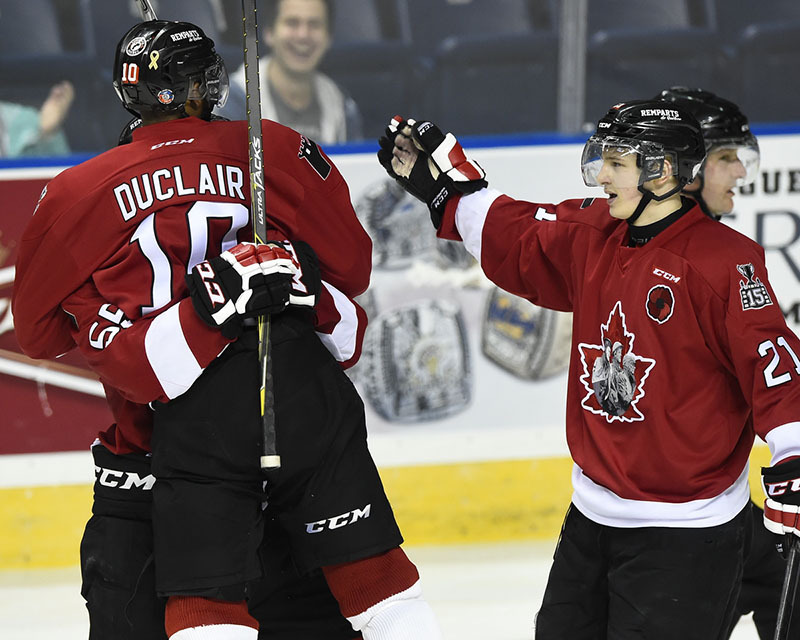 In the round-robin finale on Wednesday, I expected both teams to be playing at their very best, with the Oceanic trying to stay alive and the Remparts looking to knock out hte team that prevented them from winning the QMJHL title over a week ago. Instead Rimouski came out on top of their game and Quebec were left with their tails between their legs. Come Thursday night’s tiebreaker, the roles were reversed. Quebec’s forwards had woken up and took control of the game with ease while Rimouski didn’t do a a heck of a lot and found themselves out of the tournament. For the Oceanic, the entire week was kind of a letdown after they won the QMJHL championship in dramatic fashion. Michael Joly was fantastic, but players like Anthony DeLuca (who did not play in the two games against Quebec due to illness) and Fredrik Gauthier were hardly noticeable out there. 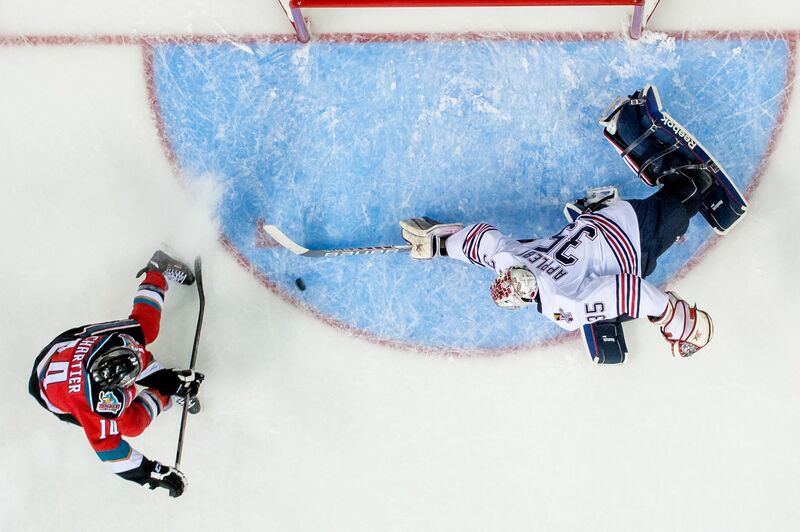 Maybe Samuel Morin and Jan Kostalek didn’t control games like some thought they would or Phillippe Desrosiers wasn’t sublime in goal (that misadventure behind his net to give Quebec a 3-2 lead wasn’t his best moment.) However, I think the biggest difference for Rimouski was the lack of multiple dynamic threats up front, besides Joly of course. In the end though, this wasn’t a terrible season at all for the Oceanic. They entered the season as the number one ranked team in the entire CHL, and while they were overshadowed by teams from other leagues, they were able to come back to defeat Quebec and win the QMJHL title. That’s not something you can scoff at. With the forwards playing well and Zach Fucale being as solid as ever (even though he got pulled against Rimouski in the round-robin finale I thought he turned in a good performance and he wasn’t really tested on Thursday), Quebec has a good chance of winning this thing. Now granted, Kelowna and Oshawa are both really good teams, but the Remparts matched up with them well earlier this week. With the home crowd on their side and Rimouski vanquished, that might give them all the momentum they need. 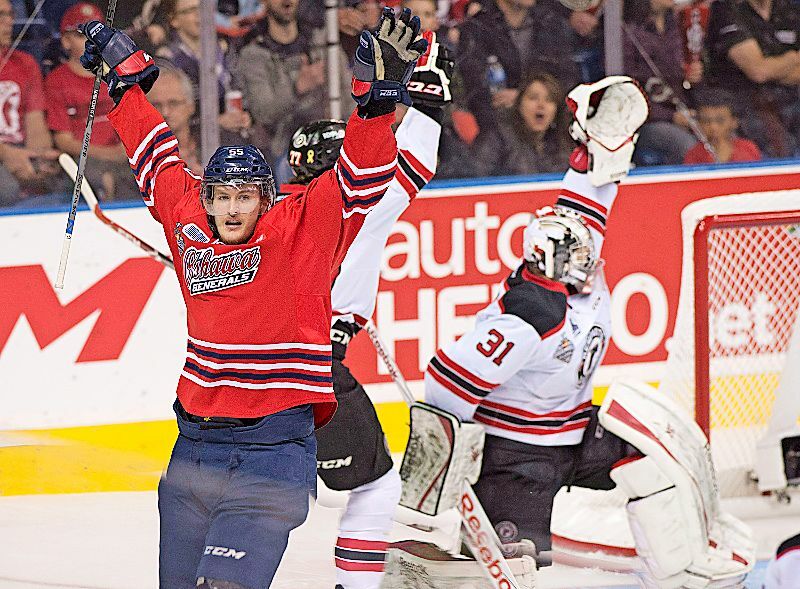 It was around the third period of Tuesday’s 2-1 win for the Oshawa Generals over the Kelowna Rockets where I finally learned to appreciate this year’s OHL champions. All year long, I felt that the Generals were overrated when it comes to the CHL Top 10 rankings (even though you shouldn’t put that much stock into them) and that they weren’t the best team in the country. 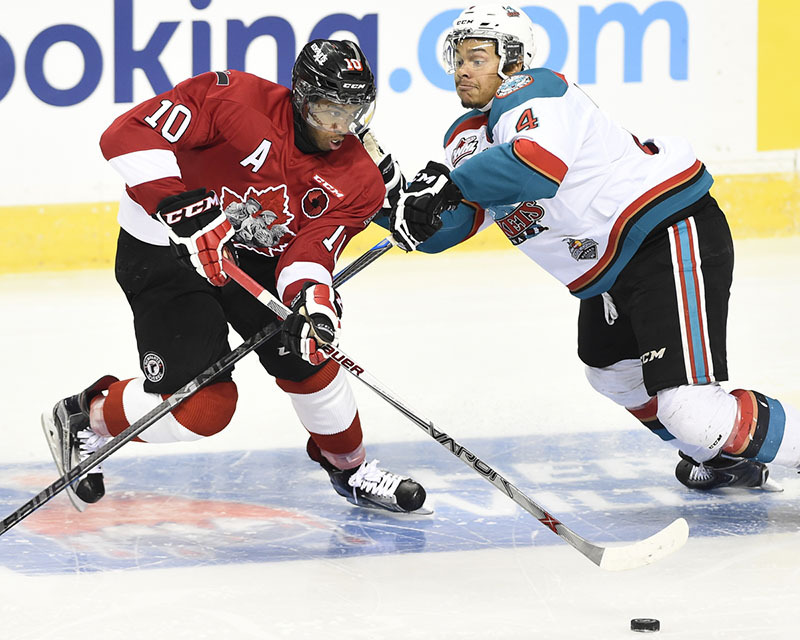 That’s probably due to my ‘the East is weak’ belief that I’ve had for a while in the OHL, but I also felt that both the Soo Greyhounds and the Kelowna Rockets were better than them with a high-powered offence. Now though, after seeing the Generals go 3-0 in the round-robin and shut down the Erie Otters for the most part in the OHL final, I’m pretty sure the 2005 London Knights would have a tough time matching up with this team. The Generals aren’t as clear-cut dominant as the Guelph Storm were last year when they went perfect in the round-robin, but their three one-goal games don’t really tell the whole story. Okay, Quebec had a chance to beat them, but Oshawa were a step ahead of Kelowna and Rimouski from my point of view. The key players this time around were up front. Cole Cassels, Tobias ‘Prop Joe’ Lindberg (check out his background photo on Twitter for a great reference to The Wire, hence his nickname that I gave him) and Matt Mistele all played well, but the best player for me was Michael Dal Colle. The New York Islanders prospect turned in his best showing yet in this tournament, and probably could have had one or two goals. Once again, Ken Appleby was stellar when he was called upon, especially on a huge save on Rourke Chartier in the dying stages of the second period and when Kelowna turned the pressure on late in the game. Unlike the last two games where he gave up a couple of bad goals, the North Bay native played an almost perfect game, which is what you hope to see heading into the final. At the moment, it seems hard to imagine Oshawa not becoming the first OHL team to win the Memorial Cup since the Windsor Spitfires in 2010. However, we felt the same about the Storm last year, only to see them stumble at the last hurdle. While the Rockets weren’t as bad as they were against Quebec on Friday, they left a lot to be desired once again on Tuesday. Sure, they put a ton of pressure on the Generals in the final minutes, but that felt like a late charge from someone doing an essay and waiting until the day before hand to do it. Once again, Jackson Whistle kept this game from being worse than it was. Now granted, the goal he gave up to Lindberg wasn’t the best to allow in terms of the time of the game that it happened (just seconds after Kelowna had a couple of chances). But if it wasn’t for him, this score would have been lopsided. While Chartier, Nick Merkley, Tyson Baillie and Dillon Dube were all solid, guys like Josh Morrissey, Madison Bowey and Leon Draisaitl were nowhere to be seen on for the majority of the game. If Kelowna wants a rematch with Oshawa in Sunday’s final, those players will need to be on their game in Friday’s semi against either Quebec or Rimouski. After three really good games to start off the 2015 Memorial Cup, I think we were due for a lopsided affair. 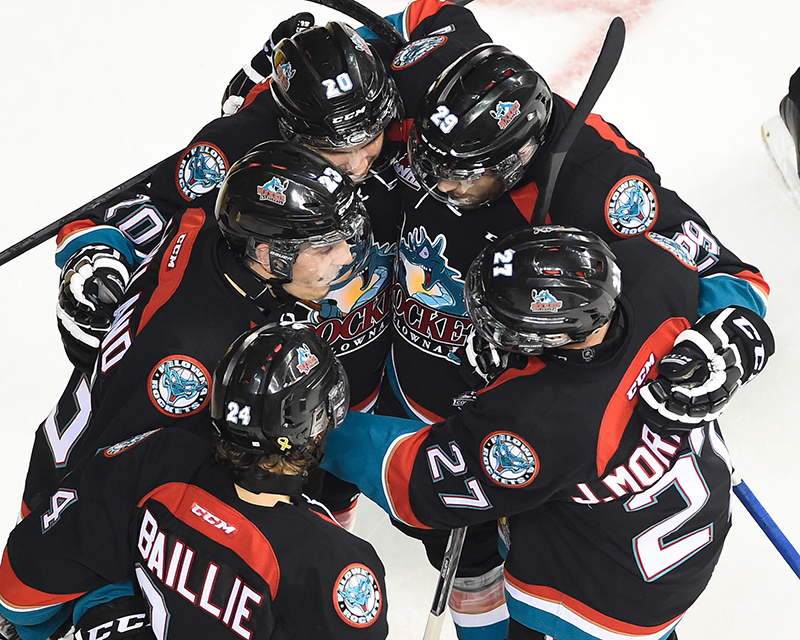 That happened on Monday night as the Kelowna Rockets had an easy time dealing with the Rimouski Oceanic in a 7-3 triumph that puts the QMJHL champions on the brink of being knocked out of playoff contention. 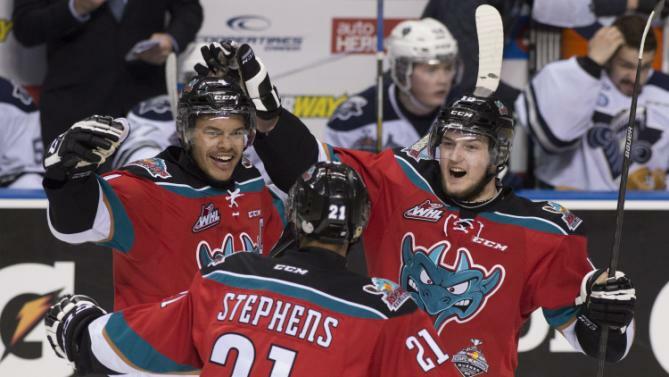 When the Rockets opened up this year’s tournament with a loss to Quebec, the biggest question mark was if Kelowna was still working off the long-term rust from sweeping the Brandon Wheat Kings in the WHL finals. While I still think there biggest issue was the fact that they looked totally out of sorts, Monday night’s win was a total team effort. The defence (especially Madison Bowey) was far better than they were in the game against the Remparts, and Jackson Whistle didn’t have to do as much as a result. Up front, Nick Merkley basically toyed with the Oceanic for the entire game and Leon Draisaitl turned in another great showing. While he will be overlooked by those two players, Dillon Dube again impressed me with his poise as a 16-year-old. I’m slightly biased because I covered him while working in Alberta, but I expect him to be a force in the WHL for years to come, and be a first round pick in the 2016 NHL Draft. Okay maybe that’s a strong statement at this point, but with his speed, size and skill, I don’t see a sophomore slump happening. This was the team that I expected to be the favourite when the week began. 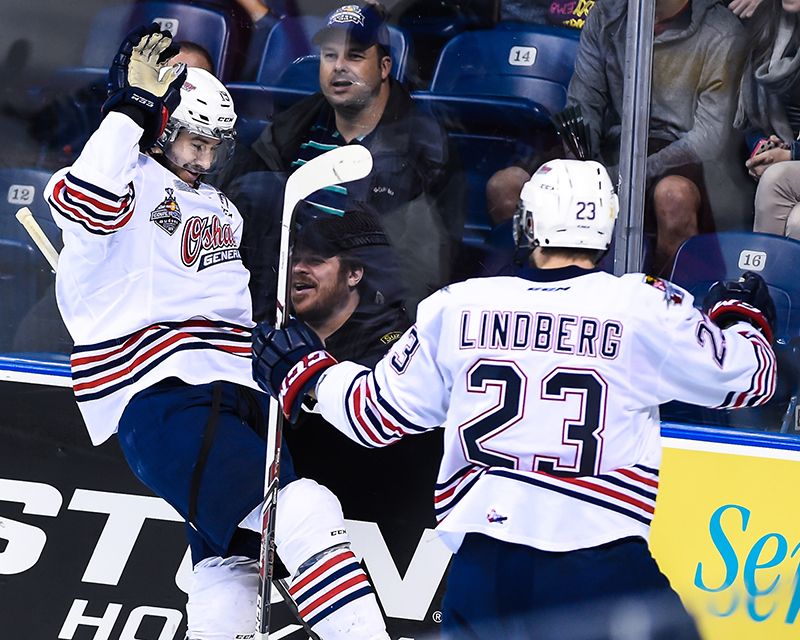 With Oshawa upcoming on Tuesday night, the Rockets are back where they wanted to be, as they have a chance to earn a bye straight into Sunday’s final. As for the Oceanic, they have more questions than answers. The defence has been pretty average so far, and the forwards have been just as invisible. Sure, Michael Joly has been impressive and Frederik Gauthier got a goal (albiet in a 6-2 blowout at that point), but guys like Anthony DeLuca and Christopher Clapperton haven’t gotten the pulses racing as of yet on a regular basis. If the Oceanic want to move into the semi-finals, that needs to change in a hurry. The goaltending rotation that Serge Beausoleil used in the playoffs was back again on Monday, though it didn’t work out as planned as Louis-Philip Guindon was pulled after giving up five goals and Phillippe Desrosiers. Desrosiers, I assume, will start again on Wednesday but I don’t think that’s because Guindon played bad. Heck, if it wasn’t for him, Rimouski might have been down 5-0 after 25 minutes. If there’s any saving grace for Rimouski on Wednesday, it’s the fact that they are playing Quebec. As I said before, the Oceanic not only won the QMJHL title over the Remparts in double overtime in Game 7, but they also erased a 4-1 deficit in Quebec just to force a deciding game. At this point, momentum is clearly in Quebec’s favour given their solid play all week. But if Rimouski can hang with them in their round-robin finale, I wouldn’t be surprised if some doubt plays into the Remparts heads. Either way, Game 8 of the QMJHL finals should be a dandy. 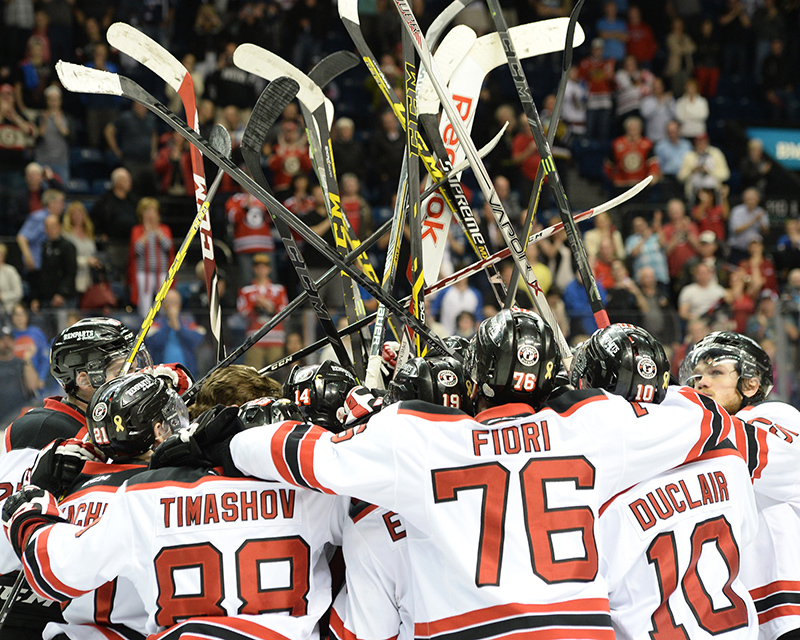 There is still a long way to go until the 2015 Memorial Cup champion is crowned in Quebec City. However, if the championship game sees a rematch of Sunday’s overtime affair between the Quebec Remparts and the Oshawa Generals, I would totally before it. In what has been a strong start to the tournament so far, this game was the best of the lot. Both teams went back and forth in a contest that built up to a frantic finish, and an impressive overtime winner by Stephen Desrocher. Once again, the big guns up front were the key players for the Generals. Michael McCarron and Michael Dal Colle were solid once again, and while Hunter Smith wasn’t nearly as impressive as he was on Saturday, Cole Cassels stepped up with some big faceoff wins. In goal, Ken Appleby made a number of big saves to keep his team in the game late, especially when Vladimir Tkachev took things over in the third. Sure, he probably wants a redo on the two goals he gave up to Dmytro Timashov, but other than that he was solid as ever. They aren’t on the same level as Guelph were last year, at least not yet, but Oshawa is starting to put a good solid claim as the team to beat in Quebec City after two wins. The overtime loss for the Remparts but a slight damper on yet another great effort by Zach Fucale in goal. Like Appleby, he did give up a couple of bad goals, but when you make 45 saves you can’t really fault the guy. Any questions about his average regular season showings should now be put to rest. Late in the game, Tkachev and Anthony Duclair were once again dynamic and Tkachev probably should of had a couple of goals. Tymashov finally made an impact but I’m still waiting for Adam Erne to break out. He’s played okay I suppose, but when you come into the Memorial Cup as the QMJHL finals MVP, I expected him to blow me away. So far that hasn’t been the case. At this point though, the positives far outweigh the negatives with Quebec. Up next is a chance for revenge in their round-robin finale on Wednesday against Rimouski in a rematch of the QMJHL championship series. You can be sure that the Remparts will be eager to win that one. The one problem with being out West is that I don’t get to watch as much OHL (or games that don’t involve the London Knights or Erie Otters this season on Sportsnet) as I would like, and the same holds true for the QMJHL . So when the Oshawa Generals and the Rimouski Oceanic did battle on Saturday at the Memorial Cup, it meant that I finally got a chance to see them up close and personal on national television instead of through the wonders of illegal bootleg internet streams. On the whole, the Generals played a really solid Eastern Conference style of game. They aren’t going to dazzle you with a high-powered run-and-gun offence like the Soo Greyhounds or have a super game-breaker like Connor McDavid (though Michael Dal Colle) comes pretty close. Instead, it’s a size and power game that drops the opponent into submission, although Rimouski nearly came back to beat them. Overall, I was fairly impressed what I saw with Oshawa. Hunter Smith moves well around the ice for a man his size, and Michael McCarron has taken huge strides after a rough first year in the OHL with London. Plus, Ken Appleby (who should have won the league’s goalie of the year) made some dazzling saves late to keep his team in front. Sure there were a couple of issues, such as coughing up an early 2-0 lead in the first period, but all-in-all this was an pretty solid start for what is a pretty good team. So what did I think of Rimouski? Well other than Michael Joly, who was great once again, they were pretty much average despite it being a one-goal game. Phillipe Desrosiers was okay in goal though, except for when he almost pulled a Matt O’Connor in the first period. As a whole though, a lot of the Oceanic’s bigger guns were hardly noticeable, especially Fredrik Gauthier. 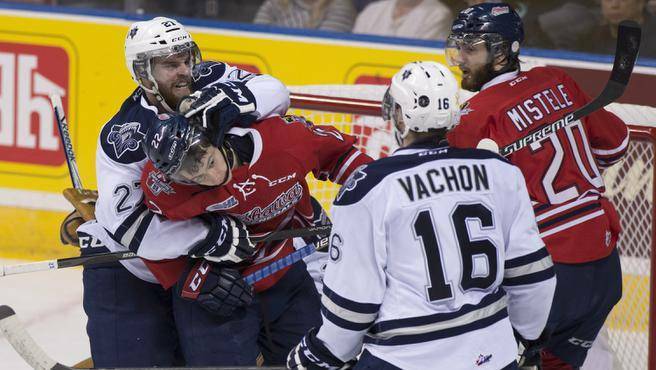 With Kelowna and Quebec upcoming on their schedule, Rimouski can’t afford any passengers. Otherwise, their tournament may come to an early end. It’s often said that the scoreboard doesn’t lie, but Friday’s result in the opening game of the 2015 Memorial Cup doesn’t quite tell the whole story of the contest. Sure the Kelowna Rockets had a number of chances late thanks to a couple of power-plays, but realistically, the Quebec Remparts probably should have won by a score of 7-2. That’s how dominant they were. 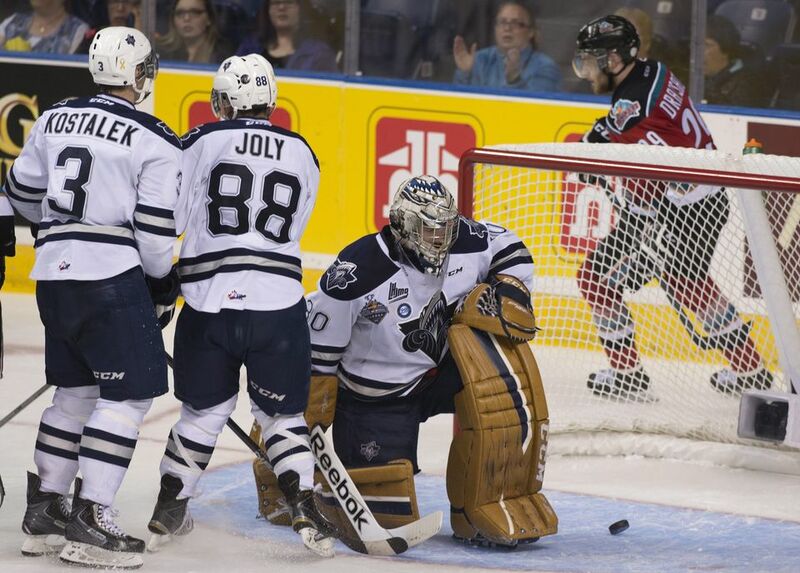 If the host Remparts had any hangover from losing the QMJHL final it wasn’t noticeable on Friday. They were pretty much relentless when they came to their scoring opportunities and they forced the Rockets into making a bunch of turnovers. Anthony Duclair stole the show a times, but Vladimir Tkachev was just as good up front. At the other end of the rink, Zach Fucale continued his strong post-season play, as he made a number of dazzling saves when the Rockets turned up the wick. 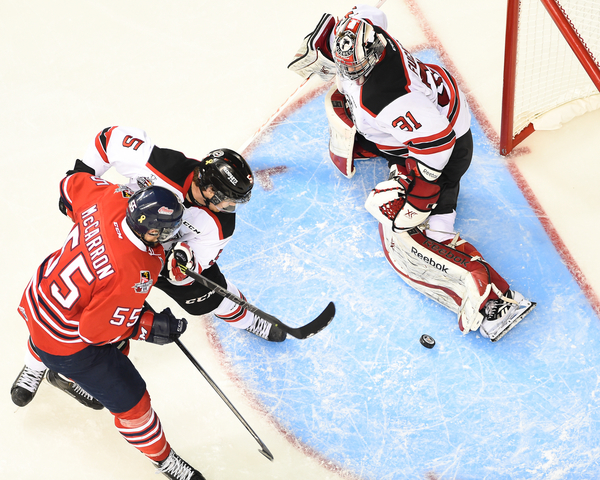 If he continues to play this solid in goal, it will be tough for anyone to beat the Remparts. I’m probably making it sound like that the Rockets were a hot mess on Friday, and that’s not a true indication of their play. However, other than Jackson Whistle’s great showing in between the pipes, there’s a lot of room for improvement before they play Rimouski on Monday. On offence, while Dillon Dube, Tyson Baillie and (to a lesser degree) Leon Draisaitl played well, the rest of the Rockets vaunted attack was hardly making their presence felt. Meanwhile, the backend wasn’t having a field day either, especially Madison Bowey who had a rough go of things. In hindsight, I probably have my expectations to high on Kelowna as I’ve felt they have been the best team in the country throughout the 2014/15 campaign. One game does not a tournament make, but if they have some of these same issues after their second game, I think we can all start pressing the panic button.